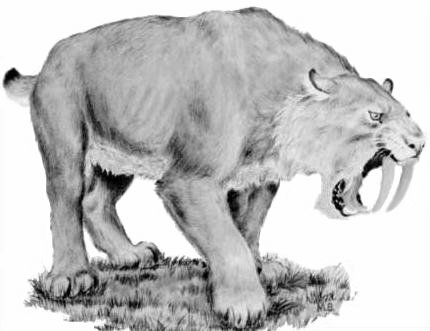 The saber-toothed cat (Smilodon californicus) was adopted by the Legislature as the official State Fossil in 1973. Since it was adopted the name has been changed to Smilodon fatalis, this change was made because the fossil had already been identified from an earlier find and named C. fatalis. As with all scientific names the earlier name takes presidents over any newer names. Fossil evidence indicates that this member of the cat family with 8-inch upper canine teeth was about a foot shorter than a modern lion, but weighed nearly twice as much. This meat-eater was very common in California and lived here until 10,000 years ago. Sabertoothed cats roamed most of North America, Europe and South America. They lived during the Pleistocene age of geologic history, which means they were here when the indigenous - people of North America lived here. Fossil bones of Smilodon fatalis have been found in abundance preserved in the tar pits of Rancho La Brea in Los Angeles, but have also been found locally at a quarry in Danville, California. In early textbooks, encyclopedias, coloring books and other children's books the fossil was listed as a Sabertoothed Tiger, it was NOT a tiger, but a cat, this has now been corrected in most books. As one might expect, gold is the official state mineral and was so designated in 1965. In the four years following the discovery of gold by James Marshall in January of 1848, California's population swelled from 14,000 to 250,000 people. Miners came from all over the world and extracted 28,280,711 fine ounces of gold from 1850-1859 which would be worth approximately $10,000,000,000 today. Although production is much lower, present day prospectors can still pan for gold in California's streams. Today there is still about 80% of the gold remaining in the gold-fields of California's 'Mother-Lode'. 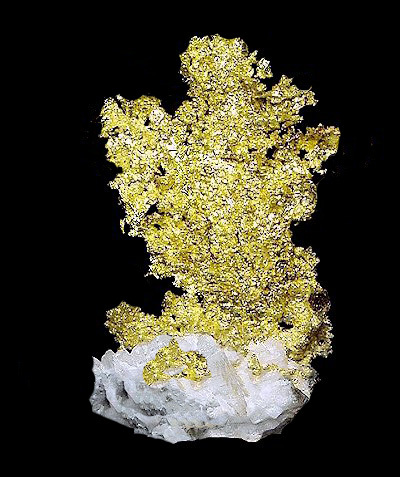 Gold in its purest form has a color of gold-yellow, hence its name. Gold is a very malleable mineral with a hardness of 2.5; one ounce of gold can be pounded into a sheet so thin that it will cover a football field and you can shine a light through it. It is 19.3 times as heavy as water. It can form crystals that are octahedrons, dodecahedrons, cubes, as well as dendrites and massive. California has a greater number of minerals and a wider variety of rock types than does any other state. Serpentine (Serpentinite), a shiny, green and blue rock found throughout California, was named the official State Rock in 1965. It contains the state's principal deposits of chromite, magnesite, and cinnabar. California was the first state to designate a State Rock. The minerals in the serpentine family contain mostly magnesium and silicon, but also can contain iron and aluminum. The rock is composed of several minerals including several forms of asbestos. You can find serpentine through out the Coast Mountain Range from the northern to the southern part of the state. 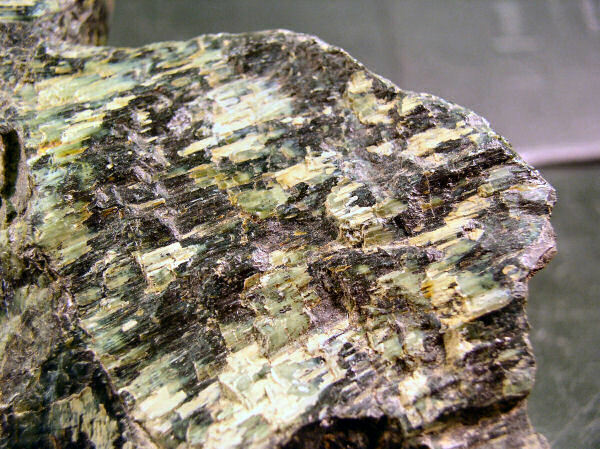 California will never rid its air of some forms of asbestos because of the minerals in serpentine.The rock should be called Serpentinite and not Serpentine, Serpentine is a mineral group. Benitoite was designated the official State Gemstone in 1985. Sometimes called the "blue diamond", it was first discovered near the headwaters of the San Benito River in 1907. It received its name because it was found in San Benito County. The gem is extremely rare and ranges in color from a light transparent blue to a dark vivid sapphire blue, and occasionally it is found in a violet shade. It is a Barium Titanium Silicate, has a hardness of 6-6.5 and a density of 3.65, and has an intense blue fluorescence under SW UV light. It occurs in glaucophane schist in a serpentine body. Associated minerals include; neptunite, natrolite, joaquinite, albite, Jonesite , fresnoite and 26 other minerals. Benitoite was first described by Dr. George Lauderback from U. C. Berkeley. The San Joaquin Soil was designated as the official state soil in 1997. The first documentation of San Joaquin Soil was made in 1900. The soil is listed as a reddish brown, sandy loam about 14 inches thick. The subsoil is a sticky and very plastic brownish red sandy clay loam about 10 inches thick. Which in turn is resting on a red or brownish red hardpan. There are more than 1500 soil series recognized in California. One reason for the cataloging of these soils is for the planning of crop types and the water use for those crops. Another reason is to determine what types of construction the soils can support. In 1983, the type location for the San Joaquin soil was relocated to a site north of Lodi, California, in San Joaquin County. At that time, a preserved 5 foot profile section of the San Joaquin soil was sent to the Netherlands World Soil Museum in Wageningen, Holland. Samples are also on file with "Benchmark Soils" a national listing of soil series considered representative of soils in Major Land Resource Areas (MLRA) in the United States.